Even before the question was finished, Siddhartha Lavu knew the answer. “I just got a really good feeling inside, knowing that my hard work had paid off,” said Lavu, who finished as the top point scorer in a closely contested competition at the Upper Valley Brain Bee, held recently at Dartmouth’s Moore Hall Psychology Building. Lavu, a freshman from Bedford High School, will now have the opportunity to represent New Hampshire in the national Brain Bee competition next spring in Baltimore, Maryland. Geisel's Bob Maue, PhD, performs “The Invisible Hand” illusion on participant Kai Renshaw, Hanover High School, 9th grade. This illusion tricks the participant into thinking an artificial hand is their own and demonstrates how the brain forms a visual definition of our body. “I think this year’s bee was the best one we’ve done yet,” said Emily Stephens, a fourth-year graduate student at Geisel School of Medicine who’s been involved in the event since its inception and again served as a co-organizer—this year with fellow Geisel grad students Arielle Baker and Stephanie Getz (who will assume Stephens’ lead role next year). Usually it’s the upper classmen who finish at the top in scoring, said Stephens, making Lavu’s performance all the more impressive. “I started studying well in advance of the bee, putting in two hours a day the last three weeks, and I went through the brain facts book twice and had my mom ask me questions,” said Lavu, who also attended a brain bee “boot camp” at the Hanover Howe Library run by Dartmouth College grad students to train for the event. He and the other competitors, along with friends, family and members of the community, enjoyed the interactive neuroscience fair portion of the bee, which featured 13 demonstration stations—ranging from how to do a neurological exam to illusions and how the brain can be tricked. The fair included a special lecture by Matt van der Meer, an assistant professor in the department of Psychological and Brain Sciences at Dartmouth, who studies the physical changes that take place in the brain when memories are made. 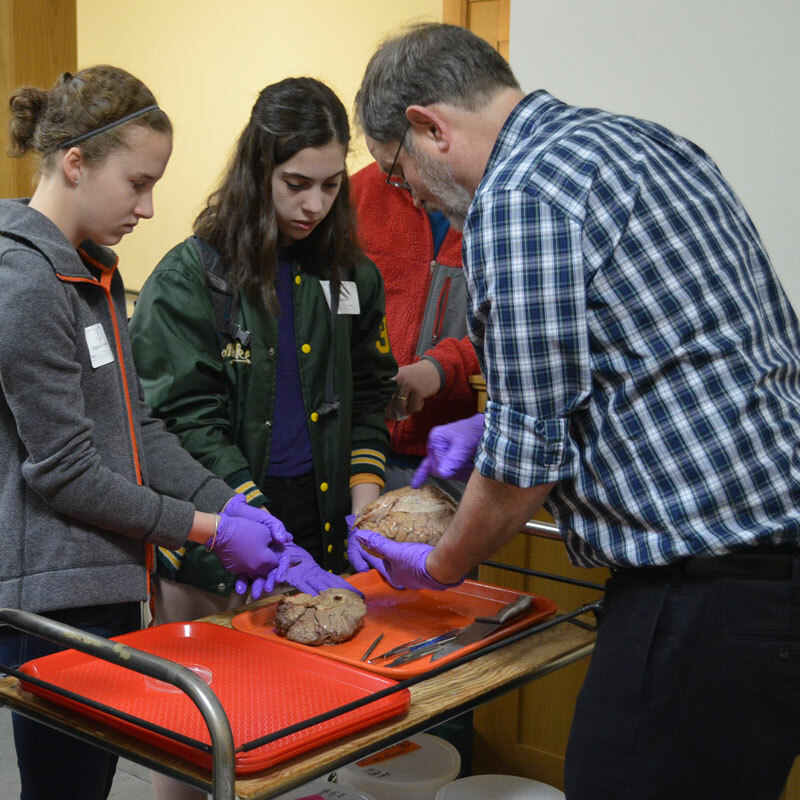 “Our station volunteers, who included friends who are grad students, teachers, and also faculty in the Anatomy and Physiology Department at the medical school, did an amazing job—their passion for neuroscience generated a lot of excitement and interest among participants,” said Stephens. 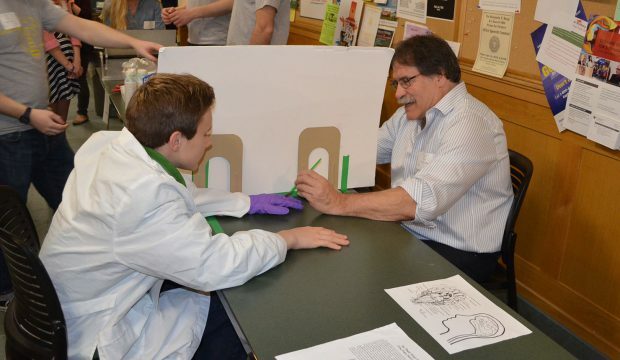 Geisel's Rand Swenson, MD, PhD, shows students the anatomy of the human brain.